This blog is now sailing to a new virtual space. 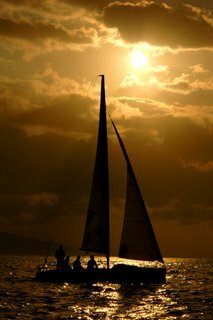 For a while now, I've been thinking of having a dedicated web space for my sailing related activities. Now, that I am getting more and more involved in match racing and sailing with a team, this idea became more relavant. So, I spend quite a few hours in front of the computer for the last month and created THE HOME OF SOYER SAILING TEAM. I wish I could have spent all this time sailing instead of web-designing, but let me tell you... working on sailing related stuff is as good as it gets when you don't have a chance to sail. Anyways, I hope you will continue to check this blog on its new location, where we will also have a chance to have much more stuff such as pictures, technical articles, race calendars and so on. Team work starts with communication. In order to execute perfect manevours everybody on the boat has to be able to communicate with short, precise, and cool commands. This is a little tricky when the racing gets thight and the team is international. At last weekends regatta we had an Italian bowman, Franco. While he was very capable, he was a little confused as we discussed most of the time in Turkish, and then switched to English from time to time, and then even some other times I tried to communicate with him in Italian! That's where the fun started. One of the things that we had to tell Franco was when to take the spi pole out and get ready for the drop. To make the communication for this easier I asked Burcu (she speaks fluent Italian) what spi-pole is called in Italian: tangone. So, I thought when we were ready I tell him simply "tangone" and he starts with the procedure. So far, so good. But, during the hectic of the first race, and when we were approaching the downwind mark, I called to Franco: "stanza". He looked back at me, doing nothing. I called one more time: "stanza". He still didn't do anything. Now, we were really getting close to the mark, needed a very good rounding, and I was getting overly excited. I yelled my lungs out: "stanzzaaaa !!! "....now Burcu interfered as well, and finally Franco got going and the spi dropped just in time, as we rounded the mark. We could only talk about the event, when racing was over and we were back in the marina. Suddenly, I realized that "stanza" did not mean spi-pole at all! I asked Burcu what the hell I was yelling at Franco. She said "room". We all started laughing. Especially from Franco's point of view, the situation was absurd. You go to a regatta with a bunch of guys you see for the first time in your life, and then in the middle of all the heat, the helmsmann starts to yell at you, "room, room, roooommm! "....the poor guy was really confused. He told Burcu that he even thought about yelling back at me his room number at the hotel !!! Next day, things went just fine even though I still mixed up "stanza" and "tangone" from time to time...but now, Franco knew better. Last weekend we were in Ancona, ITA for a Grade 4 event. Finally a competition for our strength. After being beaten up badly in the last two Grade 3 events I went, finishing this regatta at a respectable 3rd place brought the morale back. Although it was again a "put-together-at-last-minute" team (composed of my brother Cagatay, long time sailing friend and opponent from old times Burcu and her colleague Franco), we had quite fun and fought close battles on the course. Racing was done on J24's. Although this is a very old design and the boat is very uncomfy and slow then modern boats like Blu24 or Ton28, I found it quite suitable for match racing. The boat is quite slow making the pre-start tactics especially important. Further, once one has the control over the opponent, it is rather difficult for the latter to get away with a quick roll tack or gybe. After struggling during the first two races (especially with in-boat communication) we got hold of things and executed pretty good pre-start combinations in the remaining races. In the end we won 5 out of 6 races. This was still not enough to get to the finals though. Due to low winds on the first day, the committe could not finish round robin in time and had to cancel semi-finals. This meant that winners of the two round robing groups qualified for finals, while 2nd placed teams qualified for the petite final. The decisive race for us was the last one of the round robin. Both we and our oppenent had a 3-0 record up until then, meaning that the winner would be the 1st of the group. It was a nice split start but we were on the left. So, at the first cross they were starboard, and we tacked right to the front and leeward. The judge tought it was too close of a tack: we got a penalty. Up the beat it was very close and we were able to pull through on the first downwind. The second round we extended our lead a little and were about 3-4 boat lengths in front at the beginning of last beat. I thought we try to extend the lead a little more and take the penalty at the finish line. Then, at the start of the downwind leg, it seemed that they were really close and that we would not be able to take the penalty and still be ahead. I don't know if this thought was correct and they were really near or I panicked too much, but with a quick change of mind I decided to slow down the boat and try to create a penalty situation. Slowing down the boat worked fine but they just sailed down to leeward of us and gave us no chance of creating a penalty situation. So, it ended with them taking the finish and moving to the final. Although I definitely cannot train as much as I should (and would), here is something that I would definitely try out next time I'm going training. The drill, described below, is kindly provided by Fred, himself a keen dinghy and match-race sailor. I believe that he will put up a german version of this drill on his blog sometime soon. "Take 7 sailors with good helming abilities, 2 boats of the same type and a Laser, small powerboat or else. Take one small buoy/mark with you. Lay a starting line with a fixed mark or your small craft. Man the sailing boats as following: 1 Helmsman, 1 Crew, 1 Umpire each. I had prepared: 2 protest flags on sticks. 2 table tennis rackets each for the umpires. One showed black/white and the other yellow/blue. 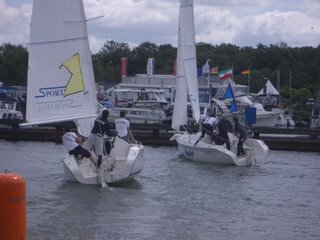 Rule Incident with a protest flag from a competitor: umpires (sitting on the stern or standing up in the hatch of the boat) shows colour of the boat (either yellow or blue flagged on backstay) Umpires show different colours: No incident. 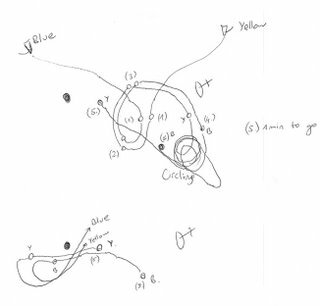 Showing white: no incident and black: DSQ. Absolutely no contact between boats!You do a full starting routine (set clock and diving in) and short windward leg until one is clearly in front. You sail back to the starting line and swoop positions. Everyone should man the starting boat once in a full round robin. The starting boat is fitted with flags and a horn or whistle. The starter should write down the results on a list. Afterwards have a good debriefing and a beer and I promise you. It will show results pretty soon. 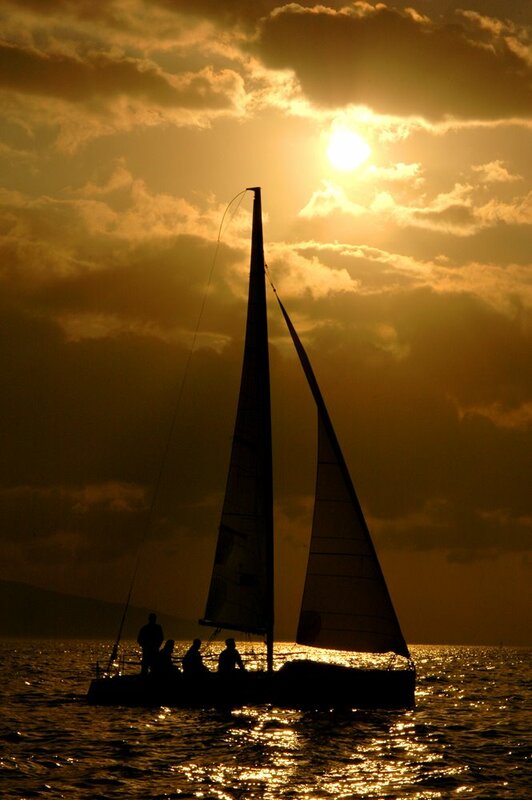 Smooth sailing." I think sharing information on such drills, situations we meet on the match racing circuit, and tips and tricks will help all of us improve faster. So, let me know of any such material you want to share and I'll post them here. But here is a help for both you and me. I've been taking notes of interesting pre-start situtations I've been encountering so far, both to study them (possibly with others) and to put them right into my memorial collection. Starting with this one, I plan to post these here. Please contribute such experiences to me if you have any (either in words or sketches, or both). The presented case is sort of a book-case that happened to me. I was the blue boat in this sketch and benefited from two big mistakes of my opponent to win the start. First mistake that yellow makes is to allow blue to get the windward advantage at position 2. From here on, blue is free to tack and get away from yellow towards the right side of the line. 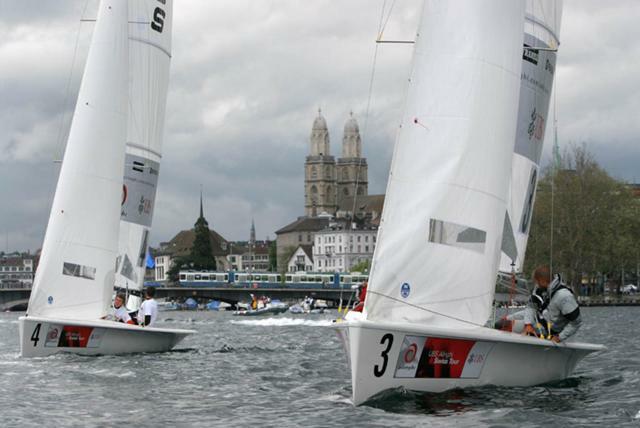 Here, the two boats start circling, a procedure that happens frequently in match racing as boats try to avoid and control each other at the same time. Now, comes the second mistake; yellow leaves the circling stage too early and shoots for the line. At the time she gets there it's too early for start. Blue, now comes from behind and has the chance to push yellow out of the line. Yellow, trying to avoid this has to sail away (run away from blue) and ends up far from the line at the starting gun, giving the lead to blue! The latest Open Match Race Rankings is released yesterday at the ISAF web site. There is a nice calculation behind these rankings. In a nutshell, it is the sum of your best four scores from the most recent two years. Each score is weighted by two factors, one based on the Grade of the event and the other based on the date. Scores from the most recent year (i.e. events occured within the last 365 days) are multiplied by 6, while events dating from 365-730 days are multiplied by 3. The grading factor is easier, it goes from 1 to 3.5 for Grade 5 to 1 respectively. So in the end the formula looks like this for each event: Score x Grade Factor x Year Factor. Given this formula, it's easy to see that during your first year it's quite important to have lots of races so that you can have at least 4 good scores under your belt. These will be multiplied by 6, giving you a boost in the rankings. For me, the numbers look not so bad so far.